The rumored iPhone X2 Plus and LCD-equipped iPhone 9 may offer you bigger and better options if you hold out on buying the seven-month-old iPhone X. First look video of the two unconfirmed Apple's smartphones come to us from CAD schematics acquired by MySmartPrice and OnLeaks. Three things should be noted: these aren't official Apple product shots, anything can change between now and September, and there are very few surprises here. The iPhone X2 Plus is said to have a 6.5-inch screen (or 'could be 6.3-inches' because, as the report notes, it's hard to account for the slight curve along the screen edges). It's a Plus-sized iPhone that doesn't look all too different from the current 5.8-inch iPhone X. There's a notch at the top of the display and dual-lens camera on back. The iPhone X2 Plus could easily be the most expensive Apple phone yet, so its price and size won't be for everyone. That's why the so-called iPhone 9 is really intriguing. It'll offer a 6.1-inch all-screen design (with a notch), according to previous reports and today's CAD drawings from MySmartPrice. But it may have a cheaper-to-build LCD screen, not a premium OLED display. However, today's CAD-filled report cites OLED for all three new iPhones. That may be harder for Apple to pull off by in 2018, as OLED supplies are limited. The LCD-equipped iPhone 9, as we're calling it, also looks a lot like the iPhone X. The back, however, has a single-lens camera, instead of a dual-lens camera. How many phones will Apple launch? New iPhone rumors are all over the place. There could be as many as four iPhones announced between Monday and mid-September – just three and a half months. Apple could finally launch the iPhone SE 2 at its WWDC 2018 keynote on Monday. It has been over two years since Apple launched the original iPhone SE phone. We foresee three possibilities for the SE 2: it could get a basic specs upgrade, transform into an one-hand-friendly all-screen phone, or not show up at all. There's even a report out there from the Korean Herald that says the next-gen iPhone will feature a triple-lens camera like the Huawei P20 Pro. That's a feature that's previously been tipped for 2019 iPhones. 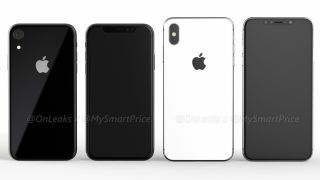 The iPhone X2 Plus, a 5.8-inch iPhone X2, and the LCD iPhone 9 are thought to be launching later this year, likely to be the usual September timeframe. Ready for a bunch of iOS 12 rumors?